Cholesterol enjoys notoriety as a pro or anti-atherogenic lipid by virtue of the lipoprotein with which it is associated. This simplistic interpretation is most evident in the positive and negative correlations with the atherosclerotic process manifested by cholesterol associated with the most abundant lipoprotein species, respectively low density (LDL) and high density (HDL) lipoproteins 1,2. The statement requires qualification, however, when lipoprotein sub-populations are contemplated. Thus, within the HDL density spectrum, the protective influence is largely believed to reside within the ultracentrifugally defined lower density HDL-2 subclass 3. HDL-3 enjoys much less support as an anti-atherogenic lipoprotein particle, a somewhat unsatisfactory state of affairs when considering mechanistic explanations of the function of HDL. 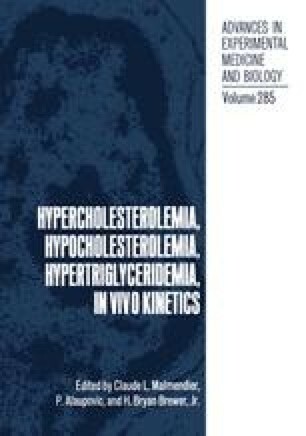 Notably, particles of the size of HDL-3 are the principal acceptors of cellular cholesterol, the initiating step in reverse cholesterol transport 4. In addition, they can act as a repository for lipids shed from triglyceride-rich lipoproteins, greatly facilitating the catabolic removal of these potentially atherogenic lipoprotein particles 5. Further subfractionation of lipoproteins into, hopefully, metabolically homogenous sub-populations is one approach which should yield more satisfying explanations. This is the rationale behind the studies described in the present report.